That is what a four-person team has been doing during the warmer months of 2017. They are members of the University of Rhode Island’s Watershed Watch, a volunteer program that monitors the health of ponds, rivers, lakes, streams, reservoirs and harbors across the state. Hundreds of monitors around Rhode Island take weekly measurements and report the results to URI’s College of the Environment and Life Sciences. 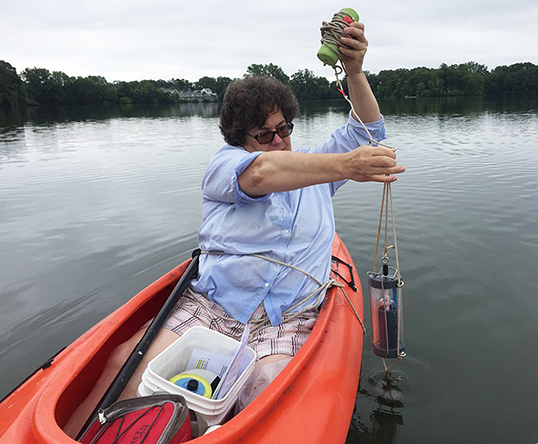 These volunteers don’t measure non-organic pollution — the heavy metals, oils and other contaminants that are in Mashapaug Pond — but rather biological markers such as dissolved oxygen, algae, bacteria, water clarity, temperature and acidification. Measuring these water resources allows one to see changes week to week, and year to year. Some bodies of water in Rhode Island have been monitored for decades, providing data to better understand ecosystem health over time. Each week, two of the Mashapaug Pond volunteers take a 5-minute kayak paddle to one of the pond’s deeper areas — about 15 feet — to take samples. They always go to the same spot, and once there, anchor and perform basic measurements: temperature at the surface, at a meter (39 inches) depth and at 1 meter from the bottom. To obtain this data, they lower a weighted cylinder with a thermometer in. The cylinder is attached to a rope, and when given an artful tug, the plug on the cylinder’s top dislodges and it fills with water. The volunteers also measure weekly water clarity by using a laminated wooden disk that is divided into black and white quadrants. Known as a Secchi disk, it is attached to a rope and weight, dropped over the side of the boat, and at what depth from the water’s surface the disk remains visible is recorded. Just from using this simple tool, you can tell, for example, that the pond is much less clear in August than it is in early June. Every two weeks, though, things get a little more sophisticated, as several bottles are filled from samples taken at different depths for testing later. These samples are put in a cooler in the kayak, and then once on shore at the house of a team member whose house overlooks the pond, the volunteers become lab technicians, using droppers to introduce three different chemicals which, when properly administered and combined, will enable a measurement of the dissolved oxygen present in the water. Once all of the procedures have been completed, the volunteers record the dissolved oxygen data on a card, along with the Secchi disk reading, water temperatures, and conditions (sunlight, wind, rain) and mail it to URI. Three times per season, we collect water samples for delivery to URI so that they can determine a bacteria count. Watershed Watch trains people to be monitors in the spring, so if you are interested in getting involved next year, sign up for a training this winter. Editor’s note: Tim Lehnert is a Mashapaug Pond Watershed Watch volunteer.